India is the world's second most populous country, but you wouldn't know if you were up in the Himalayas!! A summary with photos of a walk in the Markha Valley in the region of Ladakh in the Himalayas, by Bill Cook, was the first story from India on the site. There was a story by Andrew Spooner, also covering Ladakh and the Markha Valley, in the Guardian on 26 April 2003. 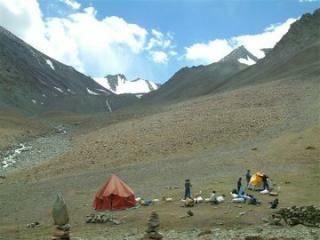 It has useful information about trekking holidays in the area. David Meldrum's account of the climb to the base camp of Chiring We gives a vivid impression of life on an expedition in the high Himalayas. Now there's a story with lots of photos by Alan Marshall, describing a tough 2-week trek to climb Kang Yatse, also starting from Leh in Ladakh. In a different part of the Himalayas, there's a story by Theresa Levonian Cole from the Guardian of 19 April 2008 about community-based treks between villages in Sikkim.